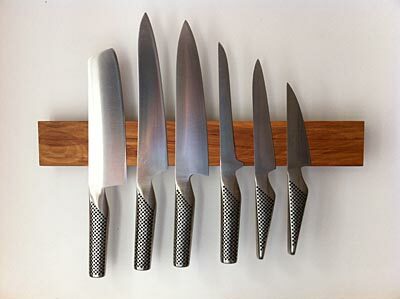 Michael has designed these beautiful magnetic knife blocks. As a carver and cutter of meat who likes to keep his knives in tip-top condition I can highly recommend these for their strong aesthetic, and even stronger magnetic pull. They are incredibly easy to install, and look great in any environment, whether you have an ultra-modern or country-style kitchen. They come in a range of native recycled timbers. At $130 a pop that’s a snip for something that will care for your knives and look great at the same time. And, in case you are wondering I’m not getting commission on sales! Knifecraft magnetic knife blocks - knives are not included!